BuyOnTheDip.com ~ Trading Stocks and Options! : BULLS take a dive! where are the dip buyers? 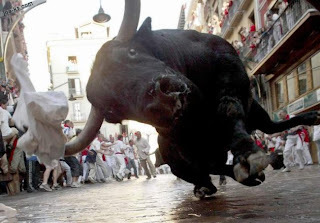 The market is trying to turn this bull....and today was painful for the DIPfoilio. almost 200pts down on the DOW...we kinda needed that. As painful as the red is, it will help us grow stronger. We hear rumors of people cashing out, taking profits, blah, blah...looking for a safer investments...if you want 5% gain in a year , go buy a CD.....if you want more BUY ON THE DIP! Are you still holding on to MPEL? What is your average on it? How are you playing it? down 25% AND OUT about a G.
and now we are stuck at 13.
you could sell....we are holding for all the reasons we like MPEL since day 3. We love growth, and we need a casino in the DIPfolio... we like LVS, MGM and WYNN too, but at the time of our purchase those were already up big....so we added MPEL...Cramer pumped, we got excited....then he dumped, and so did the stock....hindsight...we should have listened...but alas we are holding a lil' doggie. lets wait for more earnings news, more china news, more olympics news, more casino news, more 2008 news...something to get out of the hole...we dont want to take this loss...not here. not now. nice thing is when MPEL goes up it goes up relatively quickly...lets wait for "that?" news....then re-evaluate. Hey by the way don't you think HLYS is on a dip now?? BOTD says ...we already jumped on CROX, ...only one shoe play for the DIPfolio. as for HLYS let it break 52Wk Low: 27.25 before thinking of buying. & we still like CROX.